It’s really well known among my friends and family (and you guys too!) that I love to find ways to upcycle common items around my home. Seriously, I recycle everything from the list of 52 everyday items you can reuse, I upcycle milk jugs, I upcycle old sheets, I even find ways to upcycle old towels. Aside from that, I also love finding an alternative uses for something like finding new uses for clean kitty litter. For my family, learning how to have a no-waste kitchen was important. We’ve seen just how much money that can be wasted when you’re not paying attention. That’s why we try to upcycle and reuse as much as possible. It isn’t because we’re trying to save the earth or something. It’s simply because I like my money and want to keep as much of it as possible. Chances are good that you have a ton of bottles, both glass and plastic, lying around your home. Bottled juices, wine, sodas, cleaning products, beauty products, and food items all come in bottles that are not only quite handy, but are also really pretty (sometimes) when you clean them up. While your first thought may be to toss those empty bottles in the recycling bin, upcycling them can be much cheaper and so much more fun! If you make homemade beauty products, upcycling old bottles as containers for them. Just be sure to clean and dry them out fully before using them for any product that will go on your body. The same goes for homemade cleaning supplies. Using old bottles with lids that fit well and use them to store your cleaning recipes in when you make them. Keep in mind that darker bottles will work better for recipes containing essential oils since light can cause the oil to lose their properties. If you have little ones, this one is perfect if your bottle has a top that can still be attached. Fill the bottle half way then top off with baby or mineral oil. Add in some fun items like marbles, crafting pom poms, and craft glitter. Tighten the lid on and shake the bottle up to craft a sensory bottle that will draw little eyes when it is moved. If you are looking for a great kids craft, take some craft paint and let your kids paint the vase with different colors or patterns. If you’re going for a quick look with a pop of color, you could even use washi tape around the bottle instead of paint. Let the paint dry fully then use your new upcycled vase to display beautiful flowers around your home. Spray empty bottles with metallic spray paint in gold, silver, and bronze finishes. They will look beautiful when you group them together on a shelf! If you want to take it a step farther, you can create a really cool effect by using bottles that are different sizes. Another creative way to reuse a glass bottle is by making a bottle lamp. You’ll need to pick up a bottle lamp kit since it comes with everything you’ll need including multiple sized corks for the top. To do so, clean and dry your bottle then drill a hole near the bottom for the cord to fit through. You’ll put the rod part of your kit through whichever sized cork works for your bottle and attach. Once the ‘guts’ are added it’s just a matter of design. You can use stencils, glitter paint, or even Sharpies to create any design you want. Simply attach your lampshade and add a bulb. These make amazing conversation starters! Plastic soda bottles that still have the lids make for a great door stop! Simply fill them up with liquid cement and when the cement dries, they will be solid and heavy. They’re perfect for holding doors when you’re carrying groceries in! If you need something that weighs less than cement, fill the bottle with sand instead. This is by far the easiest remedy for reducing your monthly water bill and just one of the money saving tips that I talk about in my book, Six Dollar Family. With the average family size for the United States being a household of four, you could be looking at an upwards of $80-90 annually saved. Simply a bottle with water and drop them in your toilet tank. This will reduce the amount of water per each flush and depending on your toilet tank size could be an average of 12-16 gallons of water per day. I do have one caution with this: watch it after you drop it in. When we first started, we had to actually use rocks in our bottle because the water bottle was floating so much that it was keeping our toilet running all of the time. Another way to upcycle an old bottle is actually an incredibly simple trick that has many asking themselves, “Why didn’t I think of that?“. Using an Xacto knife, cut the top half off of plastic bottles and you have the perfect cup for scooping. Add it to sand and water tables so kids can play with them, use it as a disposable litter box scoop or toss one in a dog food bag so you can scoop food out with ease. Have kids? Trust me when I say that this will quickly become one of their favorite ways to upcycle bottles. Find small objects that represent the last year of your life (a calendar, a coin from that year, pictures, etc.) and place them down into your bottle. Replace the lid then bury the bottle in your yard. Choose a date when you will dig it up then dig it up and enjoy your time capsule on the designated date! Upcycling bottles into spice jars may be the easiest way to recycle old bottles period! Be sure to wash the bottles out and dry them really well before you add new spices (unless you’re really wanting to create your own rub!). Washing the bottles also helps get the old label off as well as all the glue residue. Pick up a few cute spice jar labels and fill with your favorite fresh spices! Bonus points if you grew the spices in your indoor herb garden too! Using empty glass bottles can help with setting the ambiance of a room. Grab an old wine bottle and simply put a skinny candlestick in the top. I recommend getting a drip tray (or use an old saucer) for the bottle to sit on since the wax will roll down the side of the bottle and could ruin what you have it sitting on. 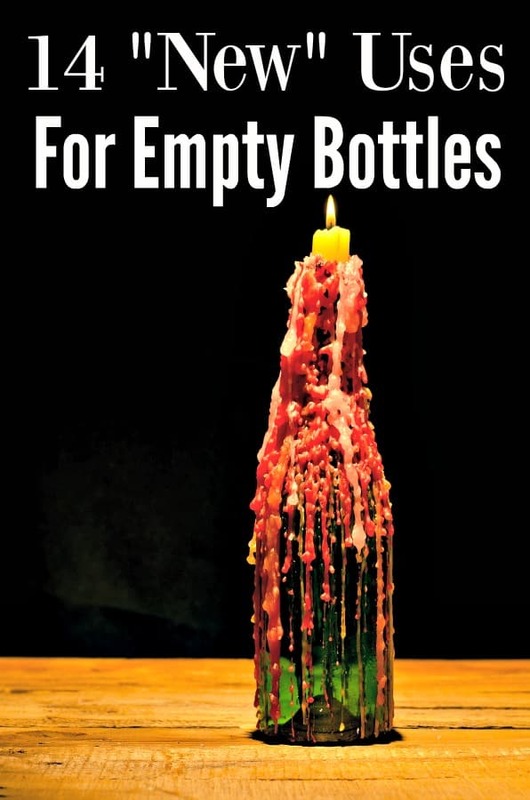 Another way you can make a homemade bottle candle is to pick up candle wicks and candle wax. Melt the wax in a double boiler and add a wick with a weight to the bottle. Pour your melted wax into your bottle and let it harden. You can even make scented candles this way by adding your favorite essential oil or candle fragrance! If you are into brewing your own adult beverages you know that you need to have bottles to put your brew in so can you guess my next tip in the list of ways to upcycle bottles? Ask around to friends and family and I’m certain they will save their empty bottles for you. Wash them out in the sink or dishwasher to get the label and glue residue off (or use Goo Gone). Be sure they are completely dry before you start filling them with your creation. Once you enjoy your beer rewash and reuse. Homebrewed beers make fantastic gifts too so if you get really good at it? Consider branding your own and giving them as Christmas or birthday presents! I love this organization method and it’s one of my favorite ways to upcycle bottles! You can turn just about any old bottles or jars into a way to organize. I do this in my garage and it has really helped keep things under control. If you have shelves set up already you are halfway done, but if not, you’ll need to either buy or build a shelving system first. Simply nail the lids of the jars or bottles to the underside of the shelf. Make sure the nail doesnt go all the way through the wood. I add a 2×4 piece of wood to the shelf for good measure, but you can skip that if you want. Add your nails, fishing bobbers, craft items, and other tiny items that seem to end up everywhere to the jar and twist it on its lid. Baby food jars and mason jars are great options, but peanut butter and empty mayonnaise containers work just as well!